Sultry morning. Long slow paddle in mirror-like seas. 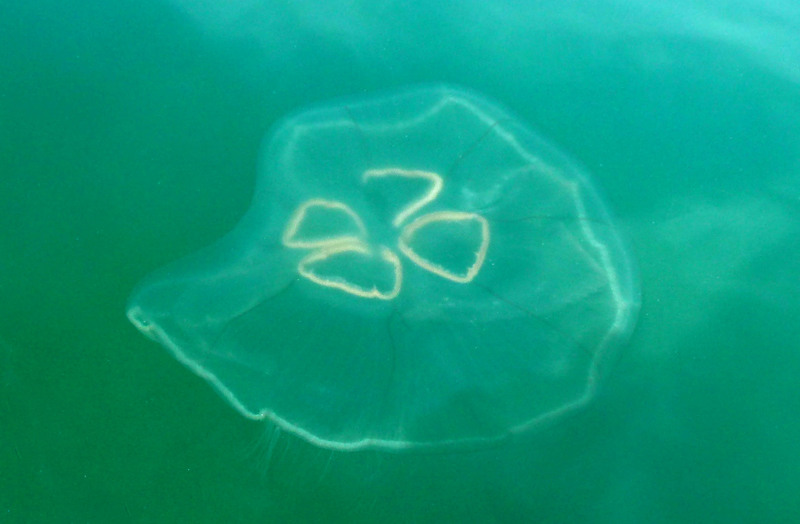 Undulating jellyfish lazily propel themselves along the surface of still water. “Common” Jellyfish (Aurelia aurita), these are the most familiar of the species. Four gonad rings – usually purplish/pink – are visible through the translucent body. In the blue-green sea this morning, they appear more golden in color. Short numerous tentacles hang from the margin of the bell. The large quantity makes me reconsider an early swim. While the sting from these is considered mild, a sting is a sting is a sting …. Besides the undulating jellyfish, artic terns, blue-footed boobies, Elegant frigate birds, and long-necked cormorants populate the morning count. I find myself in such awe of my surroundings that I cannot lift my camera. Rather, when a group of pelicans approaches, their wingtips mere inches from the surface of the sea, I simply hold my breath, listening to squished sound of the air between the water and their bodies. Farther up the coast, three sea turtles lift their heads in curiosity. My board and paddle are stealth-like compared to the noisy engines of the pangas. The largest of the three lingers on the surface watching me, and I paddle toward him. I find that turtles are relatively shy, and this one is no different. As I approach, he lowers his head and dives beneath the surface. I see his broad green body as he glides underneath the shadow cast by my board. His tips his head once, and our turtle-human eye contact is complete. I paddle farther, thinking of the turtle and the conservation efforts across the globe by groups like Grupo Torugero, or in Loreto, Eco Alianza, whose missions are to protect the natural world and those species that have become endangered or nearly extinct. Funny, this role of mankind on the planet. We seem to constantly push ourselves – and this planet that we love – to the brink – one way or another, before we can become conscious enough of our actions to change and alter our course. This entry was posted in Baja Living, Birds, Loreto, SUP and tagged arctic terns, Cormorants, Eco Alianza, Elegant frigatebirds, Grupo Tortuguero, Jelly Fish, nature, science, sea turtles, travel. Bookmark the permalink.